Ground Penetrating Radar Systems, LLC. (GPRS) of California was contacted by a general contractor to scan core drilling locations for plumbing and electrical at a hotel in East Bay area, CA. 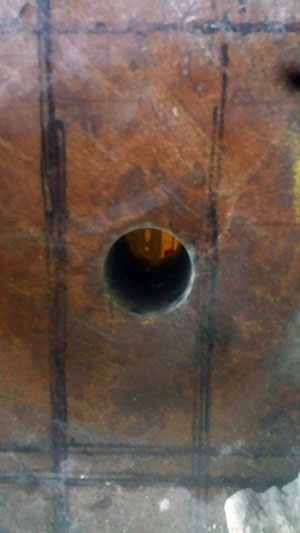 The contractor was not allowed to damage rebar during core drilling and especially did not want to drill through one of the numerous post tension cables that were embedded in the slab. 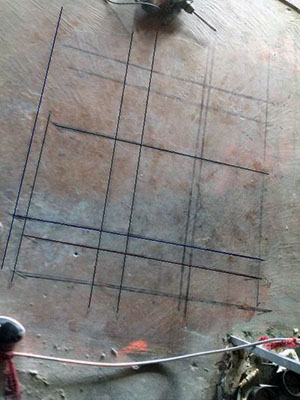 GPRS was able to locate and mark the upper and lower layers of rebar onto the surface of the concrete so that the core could be performed without cutting through post tension or rebar. Unlike conventional X-Ray, GPR is not limited to a specific size of area at each location. We were able to scan at least a 2’ x 2’ area at each location so that the contractor would have safe options for drilling. Ground Penetrating Radar is a great tool to scan areas for post tension cables, rebar, and conduits, including PVC pipes and can also be used to locate underground utilities prior to digging or excavating. Please contact Ground Penetrating Radar Systems (GPRS) to learn how we can assist with your project. To locate rebar, post tension cables, conduits, pipes or utilities in concrete or underground please contact us today. GPRS has offices throughout the entire state of California and we have completed projects in cities such as: San Francisco, Oakland, San Jose, Sacramento, Stockton, Monterrey, Fresno and Bakersfield. Please contact Tom Solich at (925) 332-6472 or tom.solich@gprsinc.com to learn more about ground penetrating radar and how GPRS can assist in your projects.